I cannot tell you how exciting it is to make this post. The PhotoComment App for your iPad and iPhone is now live and free to download. Before you ask, the Android version is coming soon – I don’t own an Apple device myself, instead going around installing it on other peoples devices and getting a kick every time – so keep a look out for the Android version when we announce it. Lets dive into some details about the app shall we? Firstly, at the bottom of the app are links to our “Scoop” or news section and the Reviews we publish on our website. 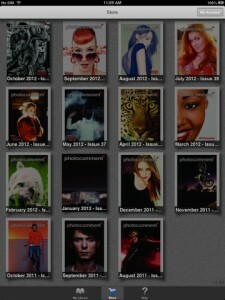 The main feature of the app however is the magazine and as such, the app will appear in Newsstand on your iPad. All of the back copies of the magazine which have been free in the past will be free in the app. The October issue moving forward which has a cover price of R15,00 will cost R7,99 (or one Dollar depending on the app store you use). If you wish to subscribe to the magazine in the app, the cost is R79,99 per year meaning you get two issues free. So what are you waiting for, go download the app now and enjoy. We would also appreciate you giving it a review in the app store. We are working on something to give to one person whom we randomly draw from the names of those reviewing the app. That means you can keep the reviews honest as the content of the review wont be determining the winner.